HappyNewyear! Did some 355 work for a few days, now I'm back on the F40. 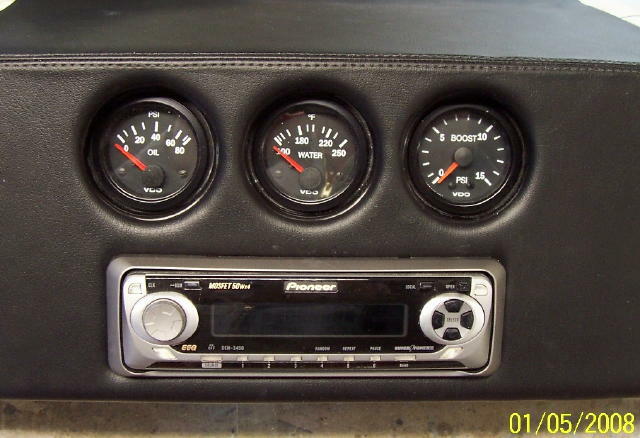 Mocked up the gauge trio & stereo with some scrap upholstery to see how it looks. I think I'll space out the gauges another 1/8" & make the holes a little smaller. Get your new seats fitted? Haven't fitted new seats yet. Passengers with hips (girlfriend Christina) will be a very snug fit. ???? They fit me tight and I am going to see if I can bend out sides on passenger seat a little. 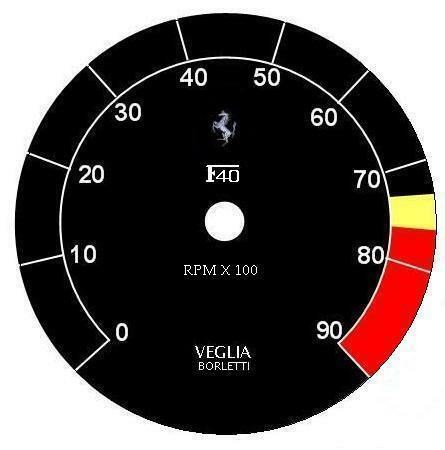 I like how the gauges are slightly angled towards the driver. Think you'll have it done in time for Carlisle? Are you going to turbo this V6 or is that guage static? Amida found original material and it is Very expensive. I like the look of leather a little better than original dash felt stuff but I might change my mind and go the original route. It would be nice to find some material similar to original stuff but without the big $$$. Btw. Amida.. This looks absolutely awesome!!!! If I could afford it, I'd love to commission a Lambo Reventon, or Lambo Gallardo Ultraleggera, or Aston Martin DBS interior. Those cars are just to die for. Think you'll have it done in time for Carlisle? That depends on when it gets done and if I get it installed in time and weather I can find a way to transport it there. 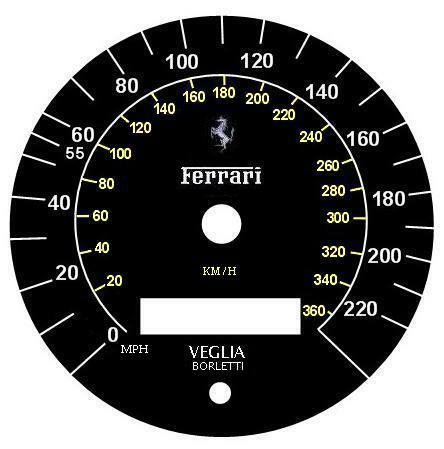 Just for show - we haven't talked about the guages I will get and their placement but I won't have a turbo. Yes, I thought I'd try charcoal suede on the first test piece after I get the tooling made which it won't be long now. Thanks. Alcantara/Micro-suede, or real cow hide? Can't wait to see pictures in either case. Here are shots of the final mockup before tooling. Reduced the hole size for the gauge trio & some edges have been radiused. The height of the fuel tunnel makes it a little tight under the dash for the heater vents. The console can either be cut shorter/ angled down at a steeper angle, or the vents can be tucked under the dash slightly. Here's a couple of shots of your instrument pod that I fabricated using a layer of carbon fiber & clear gelcoat. My first impression is that the gelcoat is not as clear as I thought it would be. It is slightly milky , and even though I vacuum bagged it during curing there are still small air bubbles underneath the gelcoat. This one should be upholstered. With one layer of carbon & glass it's a very stiff piece, however. I wish I had the facility & equipment to do dry carbon work. Screw quality, that looks awesome, put it on!
" Attached photos of a new pod that I did in carbon but without the gelcoat. I sprayed it with alcohol to hide the dust from sanding. I think it looks alot better, but will need to be sprayed with a clearcoat paint later. 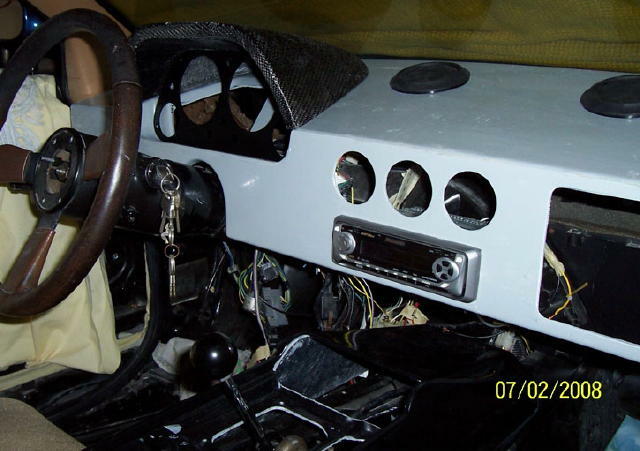 We can use this for your dash if you want the CF look in place of the upholstery." Found VDO 220 MPH speedo here in states. Enzo would be getting red if he could still life for this gigantick work quality that�s far out !!!!!!!! Lookin great! Wish mine was half that far along. Thank's - yours looks like it's coming along nicely. Like the stretch. 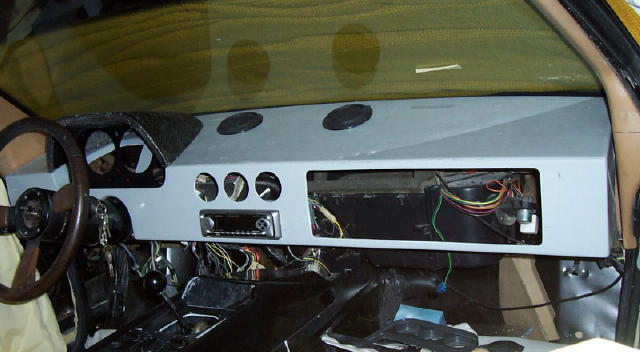 I can't wait till my replica dash is done. Great to hear that Rob has completed his new bumper design and will start back on some interior work. "Designwork on this project is now complete. I didn't plan for it to take this long, but it's done now & I'm switching mental gears back to interior work including your F40. 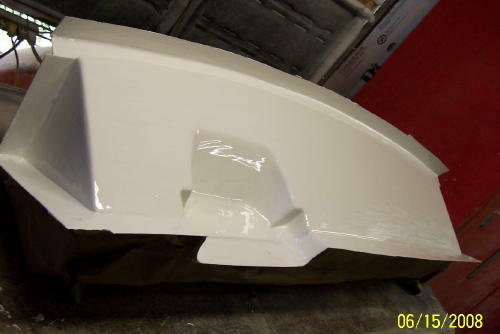 I think I understand now why John at AD doesn't do 360 bumpers; it's ALOT of work." 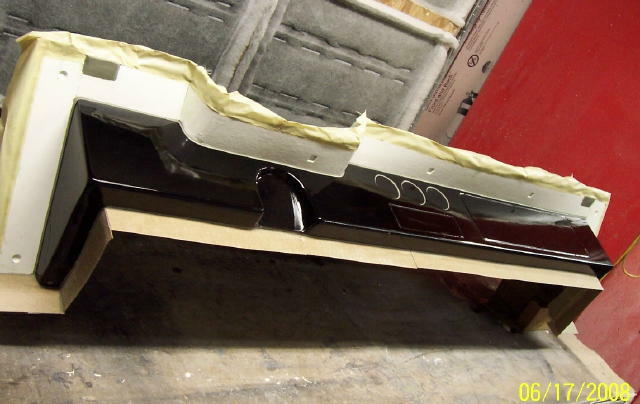 Here are some shots from today of the Fi40 dash model getting primed. If you can see it the dash is actually arched on both the top & front surfaces & even the bottom edge as well. 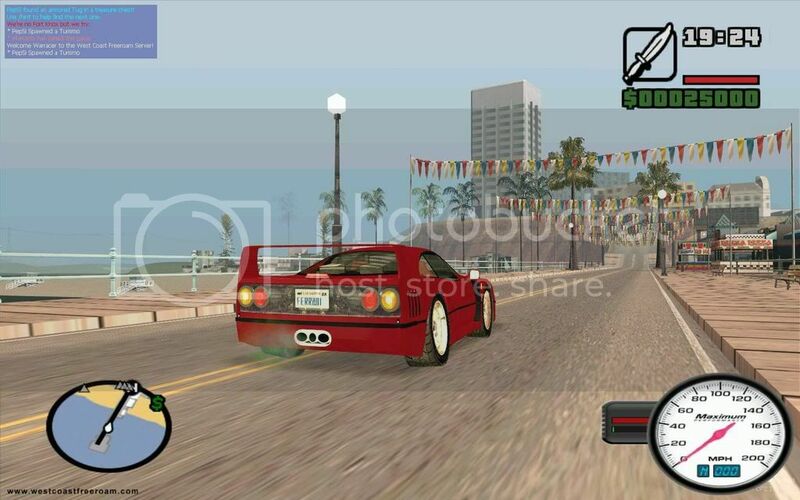 I noticed that feature on the F40 at last season's car show. Are you thinking of going with black vinyl or leather? Or something like Ultra suede?" Got some samples today for interior upholstery. I think the Granite Suede is pretty close to original look. But I don't know if I will like it against my black carpet. Should I just keep it all black and go with Black Leather? Decided to go with Granite suede color for dash and console - close to original dash material. i envy you sir. i envy you to the point where i hate you... i hate you soo damn much. Just give him the car and he will love you. 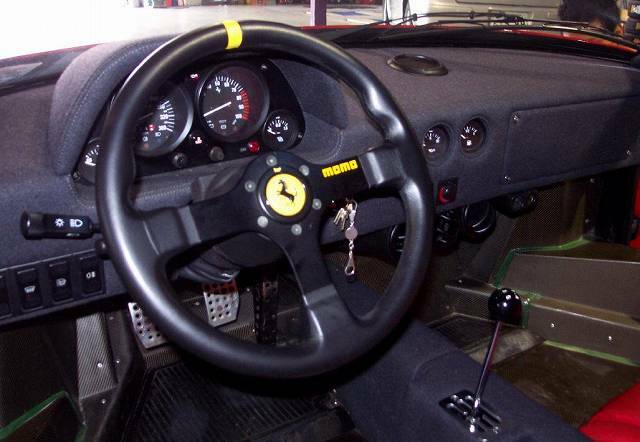 I was searching for ideas for my F40 project and came across your's. I read you are looking for door panel ideas. If you are interested I have pictures of an F40 replica with very realistic functioning door panels. I also have photos to share of my engine compartment which has fooled a few (non F40) Ferrari owners. If interested send me an email using address in membership list. Black carpet will blend with anything. If it's old & showing wear It'll be a good idea to replace it. Carpet is new aftermarket black and I think it is going to look great with the Granite Suede. 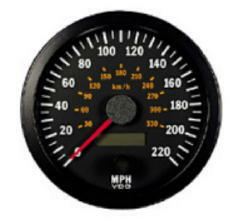 VDO 220 MPH Speedo arrived today - only took a month to get.